Chickabug featured a fun jungle themed birthday party that Jennifer threw for her 1 year old son Jack. There are a ton of fun details (like the melon monkey) that you should check out, but I had to share my favorite with you. The 8 foot snake sandwich. 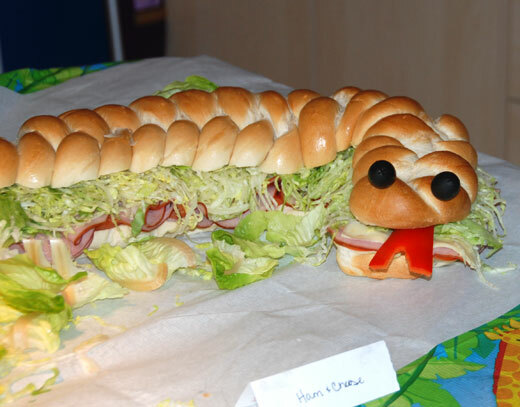 Jennifer ordered four 2ft subs from Jimmy Johns and when she told them she was going to make a snake with it, they curved the bread before baking it so it would look more like a snake. One more thing to love about Jimmy John's. A couple of black olives and a bell pepper tongue and you have yourself a very cool bell snake sandwich. Check out the rest of Jack's jungle themed party HERE.